The Sine Wave Function block outputs a sinusoidal waveform. The block can operate in time-based or sample-based mode. This block is the same as the Sine Wave block that appears in the Math Operations library. If you select Use simulation time for the Time parameter in the block dialog box, you get the Sine Wave Function block. The block calculates the output waveform. In time-based mode, the value of the Sample time parameter determines whether the block operates in continuous mode or discrete mode. 0 (the default) causes the block to operate in continuous mode. >0 causes the block to operate in discrete mode. For more information, see Specify Sample Time. When operating in continuous mode, the Sine Wave block can become inaccurate due to loss of precision as time becomes very large. A Sample time parameter value greater than zero causes the block to behave as if it were driving a Zero-Order Hold block whose sample time is set to that value. This way, you can build models with sine wave sources that are purely discrete, rather than models that are hybrid continuous/discrete systems. 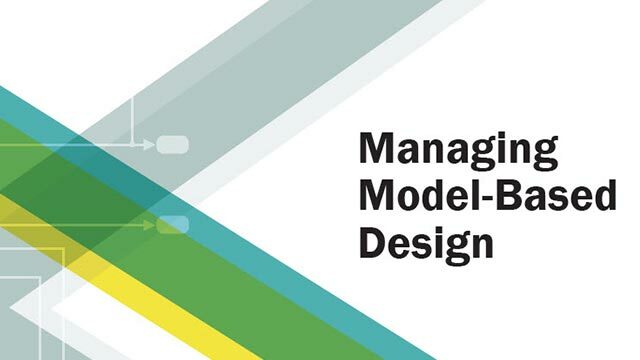 Hybrid systems are inherently more complex and as a result take more time to simulate. In discrete mode, this block uses a differential incremental algorithm instead of one based on absolute time. As a result, the block can be useful in models intended to run for an indefinite length of time, such as in vibration or fatigue testing. Therefore, the problem becomes one of a matrix multiplication of the value of sin(t) by a constant matrix to obtain sin(t+Δt). Discrete mode reduces but does not eliminate the accumulation of round-off errors, for example, (4*eps). This accumulation can happen because computation of the block output at each time step depends on the value of the output at the previous time step. To handle round-off errors when the Sine Wave block operates in time-based discrete mode, use one of these methods. Insert a Saturation block directly downstream of the Sine Wave block. By setting saturation limits on the Sine Wave block output, you can remove overshoot due to accumulation of round-off errors. 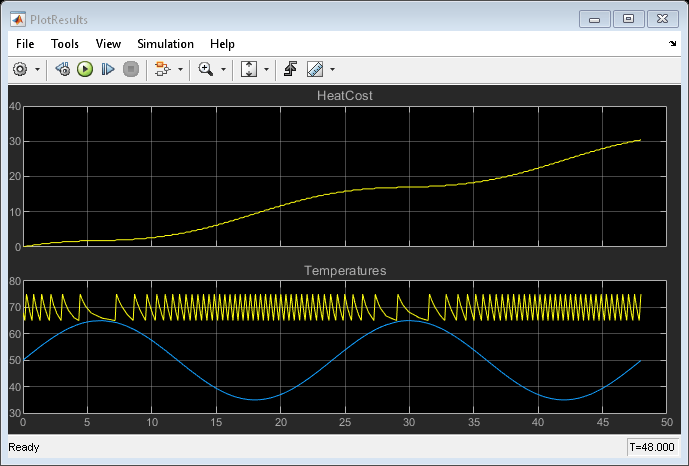 Set up the Sine Wave block to use the sin() math library function to calculate block output. On the Sine Wave block dialog box, set Time to Use external signal so that an input port appears on the block icon. Connect a clock signal to this input port using a Digital Clock block. Set the sample time of the clock signal to the sample time of the Sine Wave block. The sin() math library function computes block output at each time step independently of output values from other time steps, preventing the accumulation of round-off errors. Sample-based mode uses this formula to compute the output of the Sine Wave block. A is the amplitude of the sine wave. p is the number of time samples per sine wave period. k is a repeating integer value that ranges from 0 to p–1. o is the offset (phase shift) of the signal. b is the signal bias. In this mode, Simulink® sets k equal to 0 at the first time step and computes the block output, using the formula. 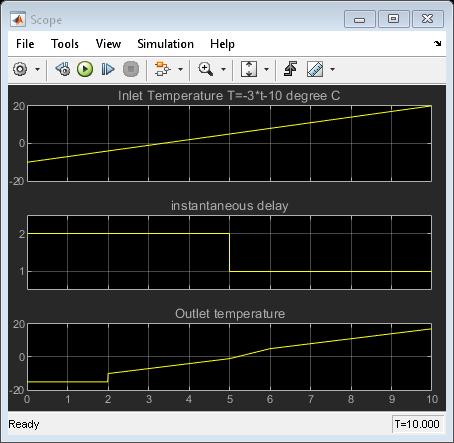 At the next time step, Simulink increments k and recomputes the output of the block. When k reaches p, Simulink resets k to 0 before computing the block output. This process continues until the end of the simulation. The sample-based method of computing block output at a given time step does not depend on the output of the previous time steps. Therefore, this mode avoids the accumulation of round-off errors. Sample-based mode supports reset semantics in subsystems that offer it. For example, if a Sine Wave block is in a resettable subsystem that receives a reset trigger, the repeating integer k resets and the block output resets to its initial condition. Input signal representing the time source in the sine wave calculation. Output signal that is the created sine wave. Specify the type of sine wave that this block generates. Some parameters in the dialog box appear depending on whether you select time-based or sample-based. Specify whether to use simulation time as the source of values for the time variable, or an external source. If you specify an external time source, the block creates an input port for the time source. Specify the amplitude of the output sine wave signal. Specify the constant value added to the sine to produce the output. Specify the frequency, in radians per second. To enable this parameter, set Sine type to Time based. Specify the phase shift of the sine wave. You cannot configure this parameter to appear in the generated code as a tunable global variable if you set Time (t) to Use simulation time. For example, if you set Default parameter behavior to Tunable or apply a storage class to a Simulink.Parameter object, the Phase parameter does not appear in the generated code as a tunable global variable. To generate code so that you can tune the phase during execution, set Time (t) to Use external signal. You can provide your own time input signal or use a Digital Clock block to generate the time signal. 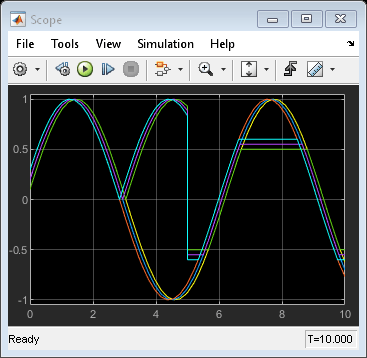 For an example, see Tune Phase Parameter of Sine Wave Block During Code Execution (Simulink Coder). Specify the number of samples per period. To enable this parameter, set Sine type to Sample based. Specify the offset (discrete phase shift) in number of sample times. Specify the sample period in seconds. The default is 0. If the sine type is sample-based, the sample time must be greater than 0. See Specify Sample Time. Specify the output dimensions to be a 1-D vector signal when other parameters are one-row and one-column matrices. If you do not select this box, the block outputs a signal of the same dimensionality as the numeric parameters. See Determining the Output Dimensions of Source Blocks in the Simulink documentation. This parameter is not available when an external signal specifies time. In this case, if numeric parameters are column or row matrix values, the output is a 1-D vector. Depends on absolute time when placed inside a triggered subsystem hierarchy. These blocks do not reference absolute time when configured for sample-based operation. In time-based operation, they depend on absolute time.